This is what it’s going to be like. And Newcastle United’s players better get used to it. Rafa Benitez’s side quickly headed for the dressing room tucked in one corner of Craven Cottage after applauding the club’s 7,000-strong travelling support. Fulham had deservedly beaten Newcastle in the first game of the Championship season on a balmy night by the river. And the reaction to the result on the banks of the Thames at the final whistle told its own story. This wasn’t just any win. It was a win over Newcastle United. It seemingly meant more to the players and the fans given the status of the club and its huge summer spend. There were very different emotions among the two sets of fans as they streamed up Stevenage Road towards Putney Bridge. Fulham won’t play this well every week. Teams will invariably be at their best when United come to town, or when they visit St James’s Park, the biggest stadium in the division by some distance. It’s going to be like this week in, week out for Benitez and his players. There’ll be no free hits, no easy points. United were poor on a balmy night at Craven Cottage, yet the game was decided by one goal. And had referee Simon Hooper seen Ryan Tunnicliffe’s first-half handball, the result could have been different. Hopefully, Hooper’s officiating wasn’t a sign of things to come in the division. But the margins will be that fine. Newcastle didn’t play well, but they were still in the game until the last kick. But they didn’t get too many kicks, especially in the final third of the pitch. Winger Matt Ritchie was lively, but it was a night to forget for many, including Ayoze Perez and Vurnon Anita, two players who had impressed in United’s five warm-up matches. Mohamed Diame will help. So too will Aleksandar Mitrovic, either from the start or off the bench, if he can keep his discipline. The midfielder wasn’t in the squad for the Fulham game, having only joined the club a couple of days earlier. Newcastle won’t be able to play through every team this season. The one and two-touch passing saw saw in pre-season will only get them so far. United need to bully and bulldoze teams. They need to be nastier at times, and they can’t be intimidated themselves away from home. Diame, a powerhouse of a midfielder, will bring much-needed physicality to Benitez’s starting XI, while Mitrovic will be able to hold the ball up, something which doesn’t come naturally to Perez or Dwight Gayle, who are best facing goal. Mitrovic is often better with his back to goal, but he has three more games of his suspension to serve. Long after the final whistle, and long after the last jubilant Fulham fan had left Craven Cottage, a sober Benitez walked into the stadium’s post-match media room. Used as a lounge before and during games, staff were busy cleaning and tidying up when he arrived to address journalists. Benitez didn’t attempt to gloss over what had happened. He didn’t blame the referee. Steve McClaren, his predecessor, had might have talked about “process” and “progress”. Benitez just said his team needed to play better, much better. Incidentally, McClaren – whose appointment as head coach last summer proved to be disastrous for United – was at the game working for Sky Sports. McClaren pointed the finger at the club’s previous structure when asked about last season’s relegation. He had a point. And Benitez – appointed manager, not head coach – has since been given full control at Newcastle – and the kind of players and characters McClaren craved. United – who face Huddersfield Town at St James’s Park on Saturday – now need points. But every slip and every stumble will be celebrated by others this season. 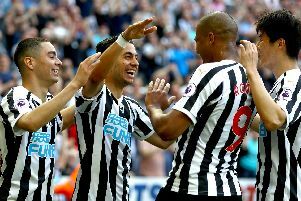 Big-thinking Newcastle, having spent big and activated release clauses elsewhere, will not be popular in a division filled with low-spending teams who have toiled for years without success. The players got a taste of this at Craven Cottage.